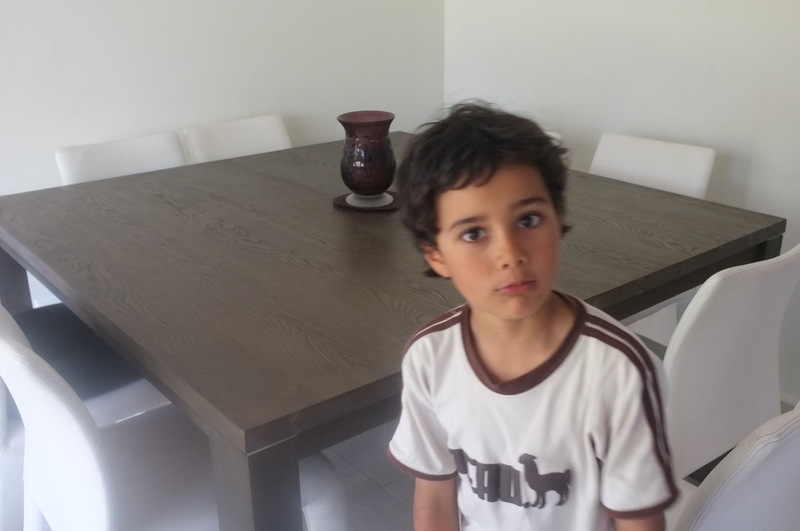 Table, and child with his ‘serious face’. My recent column as published in The Catholic Weekly. We bought a second-hand dining setting last week, it’s very modern, fairly new, and cheaper than any we could have bought from the shops. It got me thinking about how much we recycle, reuse, and reduce. We don’t go to any great effort or really think about living sustainably, and we’re not even a great example of it, but it is a part of our life and fits naturally with raising a larger family. Buying marked-down and bulk groceries, buying larger items second-hand, cooking from scratch, being content with simple entertainment and holiday options – many families live this way and it’s not only practical, it’s satisfying and responsible as well. I think it’s in families that people can best learn an integrated approach to sustainable living – to living not only with respect for our environment but also for different cultures and the human person. Everything we do has an impact on our physical and moral environment. We may buy fair trade chocolate, tea, or clothing, and shop at local farmer’s markets, and that’s great. But aspects of sustainability get ignored in our culture. There are many behaviours of ours which support structures that harm other people – behaviours that we could relatively easily change or modify. For example, I read a disturbing article about the impact that our social media habits has on the people who are hired as content moderators for some social media sites. In order to keep our webpages relatively free from offensive content they have to cull it manually. Every day they are exposed to the worst of man’s inhumanity to man, and understandably, most don’t stay in those jobs for very long. We might start hearing of people who have given up on cut back on their use of social media because it is harmful for workers’ mental health. Sustainability compasses all aspects of life – the Church teaches this. It teaches that we need to think about what we consume, we have to be fair, to not put our own wants and needs above our neighbours’ (and to do this, we must actually know our neighbours and their needs). Ethical, sustainable, living is not just about choosing free range over cage eggs in the shops. Our stand against abortion is partly a sustainability issue, an humane approach to refugees as well. Our children won’t learn this from anywhere but the Catholic Church’s social justice teachings, and we need to pass it onto them. Previous Post Want to draw some peace into your parenting? You could start with Sundays. I dont think we can say our children ‘won’t learn these things from anywhere but the Catholic Church’s social justice teachings.’ There are many avenues for them to learn about abortion, refugees, social justice, school etc.. If as parents we are not actually modeling this way of life our children are quite likely to miss the whole idea in-action, because that is where the real learning is had, through conversation and communication. Oh I agree with that 100% Sinead, it’s got to come from parents and teachers and other mentors, but I meant that the Catholic Church is the shining light in this regard. It informs us and forms us, holding up an wholistic vision of life, and respect for life in all its forms, and gives us the tools to live life well. The other major religions do this as well to some degree – I find some aspects of Buddhist and Hindi thought and tradition really beautiful.